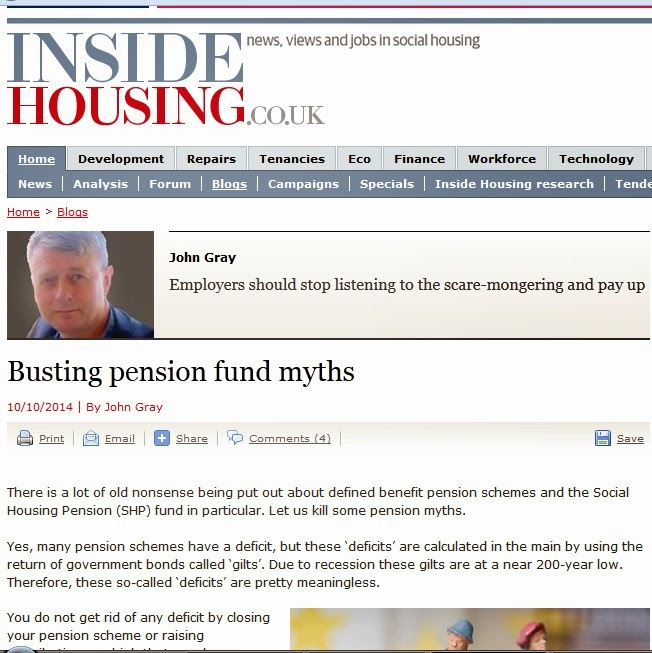 John's Labour blog: Busting pension fund myths - Stop the scare-mongering & pay up! Busting pension fund myths - Stop the scare-mongering & pay up! This opinion piece was published today in "Inside Housing". "There is a lot of old nonsense being put out about defined benefit pension schemes and the Social Housing Pension (SHP) fund in particular. Let us kill some pension myths. Yes, many pension schemes have a deficit, but these ‘deficits’ are calculated in the main by using the return of government bonds called ‘gilts’. Due to recession these gilts are at a near 200-year low. Therefore, these so-called ‘deficits’ are pretty meaningless. You do not get rid of any deficit by closing your pension scheme or raising contributions so high that members cannot afford to remain. In fact, you could make it worse. A closed pension scheme will not have new money coming in and will soon find that it will not be able to invest in long-term equity investments that produce superior returns. So employers could end up paying even more to close this gap. It is the cost of future membership that is key. Ignore the scare stories. The cost of a modern defined benefit pension is affordable and sustainable. Why is it that they are opening brand new defined benefit pensions in South Korea, which has among the highest life expectancy in the world? Unless an employer wants its workers to retire and die in poverty then they have to pay up. There is no alternative. At my first ever Trades Union Congress pension course we were told there is a old-fashioned but valid rule of thumb that, if you want to retire at half pay and with a lump sum, you need to save 20% of your income into a pension fund for 40 years. Whenever I tell people this they are shocked. But this is the reality. Pensions are expensive. Employers need to be putting in at least 14% of the wage bill into pensions. Poverty in all its ugly forms is obscene, but in front-line housing management I find poverty in older people to be perhaps the most depressing, since there is little they can do about it at that stage. At a time that many housing associations are making massive record surpluses, giving above inflation pay rises to executives and after years of pay cuts (most staff are at least 20% worse off in real terms because they received no or below inflation pay rises) they meddle with their staff pension schemes at their peril. Unison has arranged for early talks with the SHPS and is more than willing to meet up with any employer to discuss their concerns. But enough is enough.